National Running Day was June 7. We all know that running is highly beneficial for cardiovascular health but it also has many other benefits. If you want to add running into your daily exercise regimen but are not sure where or how to start, read on! We asked Wake’s director of Team Experience and running enthusiast, Lisa Kiezbak to spill all the dirt on running. Lisa has many years of experience training for marathons and running is a part of her life. (Yes, that’s her in the photo above during her Spartan race!) Lisa inspires all of Wake’s staff to stay active and healthy and we wanted to share some of that inspiration with our readers. Remember, consult with your physician before you start any exercise regimen. – Being out in the fresh air moving my body. – Better mood and attitude for the rest of the day. – Running helps me feel good about myself. – Running is also a great opportunity to listen to your favorite music and/or an interesting podcast! 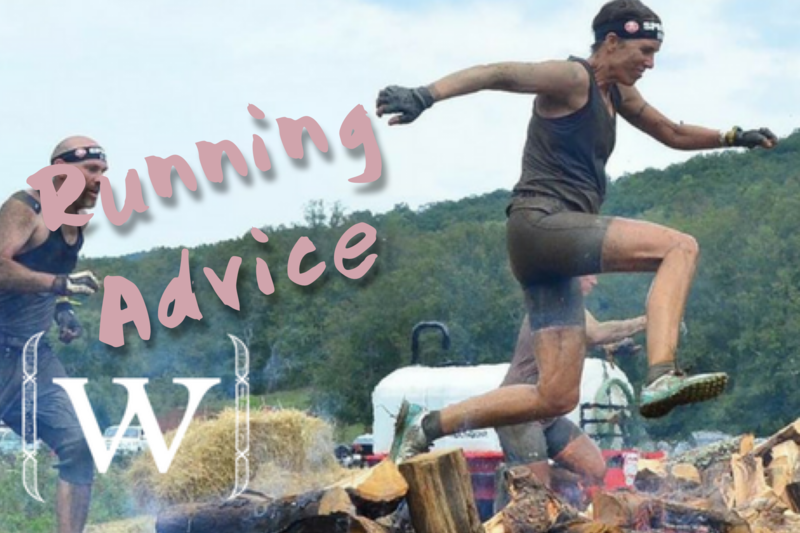 What recommendations do you have for a newbie runner who wants to incorporate running in their life but they don’t know where to start? Start out slowly! If you begin by thinking you are going to go out and run a mile or three right off the bat you will get discouraged. You will also have trouble walking the next day! Start by walking 30 minutes. When you are comfortable doing this, try a walk/run combo (ex: walk 4 minutes/run 1 minute for the 30 minutes). Then start increasing your running (ex: walk 3/run 2, walk 2/run 3, etc). Pretty soon you’ll be running longer distances with little or no walking. And, by the way, there is no shame in walking! Walking is an excellent form of exercise! However, don’t walk like a sloth. Put a little pep and zip in your step! Attitude is everything! Feel the fear and do it anyway. For many years I battled with feeling immensely uncomfortable running or exercising in any way out in public. Shame (and body shame, in particular) can have devastating effects on us. It is ok to feel uncomfortable, but feel it and get out there and do it anyway. Eventually, it will get easier. Reward yourself for getting out there! For some of us, a hot fudge sundae reward will defeat the purpose of getting out there! Try rewarding yourself with a bubble bath, a cup of good coffee, a nutritious breakfast, a new pair of jeans, or kind and loving words to yourself. Run with a friend or join a running group. There is no better motivation than running with people who will hold you accountable and vice versa. Research “Couch to 5k”. We have so much information at our fingertips. Do some research and invest some time in YOU! You will find just the right running program to fit your needs. How do you stay motivated when you don’t feel like running? Wow. This is a tough one! I absolutely LOVE running, and yet I truly struggle with motivation sometimes. Set your clothes out ahead of time the night before. When it comes time to run, just put on your clothes and go do it. It’s as simple as that! If I start listening to my head chatter I’ll talk myself out of it! I get my clothes on and my headphones tuned into something I love quick! Then I just get out there! Running with someone helps too. You can motivate each other to run when one of you is struggling. What are some tips on preventing injuries? DRINK WATER! Water lubricates our joints and feeds our muscles. Try to stay away from sugary sports drinks. If you want/need something with electrolytes then drink coconut water. Coconut water is healthier and has more electrolytes than Gatorade! Mix it up a bit. Cross train. Do some weight training, swimming, maybe some biking, or other activities. Working your muscles in different ways regularly will keep your body balanced and in better overall shape. Are there any specific foods that one should incorporate into their diet as they begin a running routine? Here is the real deal: No matter if you are a vegetarian, meat-eater, or vegan, we ALL need to eat more fruits and vegetables. Increase both of these in your diet and decrease the crap and you’re doing great! Any tips on dealing with feeling winded during a run? You are going to feel winded periodically during a run depending on how far and/or fast you are running. If you are feeling winded, and it is uncomfortable, you can decrease your speed or walk. As you increase your aerobic capacity your episodes of feeling winded will decrease and change a bit. When I was at my most fit-while-running time of my life I still went on runs where I felt winded. Running hills will make even experienced runners feel winded. Feeling winded isn’t necessarily a bad thing. If you are feeling winded to the point of feeling light-headed, dizzy, “not right”, then, by all means, slow down, walk, or stop and rest. Most of us aren’t training for the Olympics. Put it all in perspective. You aren’t a failure just because you got winded. Staying alive and having fun is first and foremost! Running has been a part of my life in one way or another ever since I could walk. As children, we run and play and we do it with such wild abandon and joy. This is something that I have tried to hold on to and use to inspire my daily life. Running has made me healthier, happier, and provided me with countless opportunities to push my limits, explore my boundaries, and awaken myself to heights I never imagined possible. Do you have any tips for running? Feel free to leave them below in the comments and get out there and run like the wind!